Returning to Hungary is like slipping into a warm bath. I enjoy this circuit, which is pretty quick and doesn’t offer up anything too challenging (unless you drop your concentration). Turn 1 is great – a huge right-hander, and turn 4 can be hit with decent speed, but a lack of care can see you run the kerb if you’re not careful. Turn 5 is pretty quick and but the chicane can catch you out – my temptation was to brake late, but you can’t really get away with that. 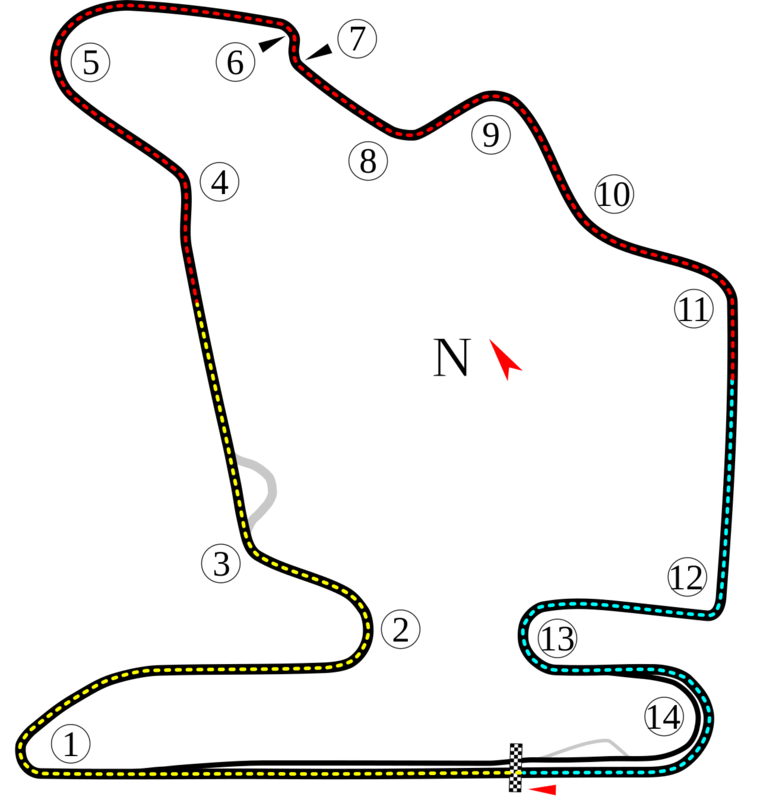 Hungary has a reputation for being tough to overtake on and corners 8, 9, 10 and 11 are fast, sweeping turns that make it impossible to get by anyone, and the way the track winds means you can get by someone at one corner, only to lose the place back at the next corner. The track has one or two bumps and kinks that you need to be aware of – take them wrong and you’ll also take the corner horribly wrong, so it’s important to be aware of them. Turn 4 has one such feature, as does turn 11. As far as the race is concerned, I only did one practice run (to see how the tyres held up over distance). The first time around, I discovered that Hungary punishes tyres hard, so I ran the race largely on the hard tyre, only doing one stint on the soft (the opposite of what I prefer). I did this again here, doing around 19-20 laps at a time on the hard tyre, so that my stint on the soft tyre was only around 12 laps (they weren’t going to do much more than that). I was able to qualify on pole easily, but did my customary job of losing a place at the start (this time to Red Bull’s Mark Webber). On lap 2 (I think) I got alongside Webber getting out of turn 7 and toward turn 8, and I was on the racing line despite being on the outside of the corner. I thought I was clear of Webber, but we had a minor bump as I swung inside, and he went to the outside. Our collision saw him come off the track, but I was able to carry on, car undamaged. What I did notice was that Webber didn’t lose many places to this, but he must have hit Vettel as he rejoined the track, for when I checked the standings, Vettel was last (well, there wasn’t a lot of love lost between them in real life, so the game might as well mimic life!). With hard tyres on I was able to edge away from the chasing pack quite easily, and though I slipped down to fifth at the first stops, I regained the lead when everyone ahead of me pitted. By the time the second set of stops arrived, I emerged just barely ahead of Jensen Button, but was able to pull away once again. Come the final stops, I had a reasonably comfortable gap, and saw out the race without bother or trouble. I am now 17 points clear in the championship.